That alphabet-soup title translates to Lactate Threshold Heart Rate Time Trial, for those in the know. Here's a 60-minute workout that will help you approximate your LTHR for the bike (keep in mind it will be different on the run, and LTHR isn't an accurate measure to use in the pool). You can also use this workout to estimate your functional threshold power (FTP), if you have access to a power meter. There's a 20-minute warm-up to get you ready for the time trial, and the time trial is 30 minutes long. You should go as hard as you can for those 30 minutes. If you're testing heart rate, hit the lap button 10 minutes into the time trial; your LTHR will be the average heart rate you sustain for the last 20 minutes of the time trial. If you're testing FTP, take the average for the whole 30 minutes (so you'll hit your lap button at the beginning of the time trial). Since the beginning of 2015, I've been teaching my cycling classes some of the ins and outs of training with heart rate and power. Heart rate training isn't as cutting-edge as it was at the turn of the millennium, when Polar was all the rage and heart rate monitoring was considered the truly scientific way to train. NBC specifically mentioned Mark Allen's relatively innovative chest strap in its broadcast of the 1990 Ironman. In the years since, we've learned that heart rate doesn't provide as absolute a measure of intensity as was originally believed (or promoted by companies like Polar). In short, monitoring heart rate doesn't necessarily lead to "scientific" training; it just provides additional data to the overall picture. Still, heart rate training remains a valid training tool, in spite of any drawbacks associated with its use. It may not be the best tool; you shouldn't use it for every application; it might not be appropriate for all athletes; but it is still a tool in the athlete's box of tricks. I think it's worth examining the pros and cons of training with (or without) heart rate. Heart rate monitoring allows you to tune out. This can be a positive or a negative, much like running with music. On the one hand, heart rate monitoring may encourage you to pay attention to a somewhat arbitrary number rather than listening to your body. Especially because heart rate can fluctuate so much based on external factors (heat, overtraining, lack of sleep, dehydration), you may end up working lighter than you could or harder than you should based on the number flashing on your wrist. Even with a heart rate monitor, you should learn to pay attention to your body. Your heart responds differently when you're overtrained, hot, or dehydrated. There will be days when your heart rate tells you you're not working hard enough, but you really need to back off. Or maybe your fitness will improve (i.e. your numbers will change) before your next fitness test, and your body will tell you that you can work harder, even though the numbers tell you to slow down. Like with all data (yes, power junkies, ALL data), heart rate monitoring has its limits, and it can't replace mindfulness and awareness of what's happening in your body. Heart rate doesn't immediately change when you change intensity; it lags by anywhere from 30 seconds to 2 minutes. That means that on short, high-intensity intervals, heart rate tells you nothing until after the interval's over. Even worse, on longer intervals, you may be tempted to work harder than you should for the first 30-90 seconds, waiting for your heart rate monitor to show the change in effort. You end up performing the first 2 minutes of a 4-minute interval too hard, the last 2 minutes too easy, and you totally defeat the point of doing a 4-minute interval. The best (but harder) solution is to learn to pay attention to your body and its signals. The easy (but more limited) solution is to train with a power meter, which I'll discuss next week (because training power has its own advantages and disadvantages). Heart rate training basically doesn't work in the water. Your vascular pressure is so different in the water that pulse doesn't accurately reflect your work rate. To determine intensity in the water, you have to go by pace and rating of perceived exertion. This link will help you set training zones based on pace. If you're water jogging or doing water aerobics, you're better off with perceived exertion. One of my favorite uses of heart rate monitoring doesn't even require the fancy equipment. Just take your pulse every morning. Elevated resting heart rate is an early indicator of overtraining; it usually shows up before other symptoms, like crankiness and weakened immunity. If you keep track of your average resting heart rate, and back off on days when it's elevated, you're more likely to avoid the nastier aspects of training too hard. For example, I take my heart rate every morning using an iPhone app. I get up, go pee (for some reason my heart rate's higher before peeing), lay back down, and take my heart rate. My fully-recovered heart rate is around 52; my normal in-training heart rate is around 56; if my first-thing-in-the-morning heart rate gets above 61, I take it easy for a day or two. Just make sure that you take your resting heart rate at the same time and in the same circumstances every day. First thing in the morning (right after peeing) is best, to make it as repeatable as possible. Even if you take it after breakfast, the results might be affected by variations in what you ate or drank. Probably the greatest benefit of training with heart rate zones, having that number handy may help knock you out of a steady-state aerobic rut--it may help you to vary your training intensity. Many (most?) cyclists, runners, and triathletes fall prey to the cardinal sin of endurance training: going too hard on the easy days and too easy on the hard days. Improvement stagnates with that training method, and using a heart rate monitor to set and train within zones helps you avoid that pitfall. I use lactate threshold heart rate (LTHR) to set my training zones. To find your approximate LTHR, you can perform a 30-minute time trial on the bike or run. Warm up thoroughly (I recommend 15-20 minutes of warming up, with some light accelerations towards the end), then start riding/running at race intensity. After 10 minutes, hit the lap button on your heart rate monitor (if you have a lower-end heart rate monitor, it probably doesn't have a lap button, in which case you can stop and then re-start it with a new workout). The average heart rate for those last 20 minutes of the time trial is your approximate LTHR. Keep in mind, though, that just because your first 10 minutes don't count in the average doesn't mean that you should ride them at a lower intensity. Keep in mind that your training zones will be different for the bike and the run; your running zones will be higher because of body position and the increased effort of supporting and moving your body weight. That's all that I have to say about heart rate, for now. I am working on a free cycling workout to help you do a 30-minute time trial indoors on a trainer or stationary bike. Look out for that next week, as well as an article on the basics of training with power. 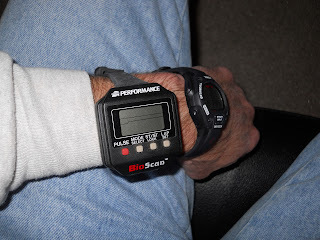 By the way, this is the heart rate monitor that I use.